ABS 2 is a commercial communications satellite built by Space Systems/Loral for operation by Asia Broadcast Satellite, ABS. The satellite is also known as ST 3 and Koreasat 8. The spacecraft is based on SS/L’s LS-1300 satellite bus that can accommodate powerful communication payloads featuring up to 90 active transponders with a satellite power of up to 18 Kilowatts. LS-1300 has extensive flight heritage having flown a variety of missions, mostly for commercial communications companies. Weighing more than 6,000 Kilograms, the satellite uses two 5-panel solar arrays to deliver more than 15kW of power that is stored in several onboard batteries. The satellite uses a chemical propulsion system for apogee maneuvers and stationkeeping in Geostationary Orbit. ABS 2 is three-axis stabilized with precise pointing capability. ABS 2 is equipped with a communications payload incorporating C-, Ku- and Ka-Band systems. 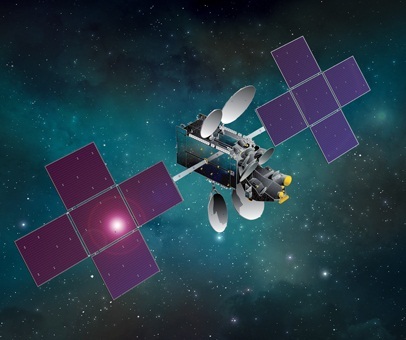 The satellite features 32 C-Band transponders with transponder bandwidths of 32, 72 and 104 MHz, 51 Ku-Band transponders with bandwidths of 54 and 108 MHz, and 6 Ka-Band transponders using the commercial 435 MHz and 225 MHz military bandwidth. Services provided by ABS 2 include Direct-to-Home television, cable TV distribution, multimedia and telecommunications services for commercial and government customers as well as military applications. A part of ABS 2 capacity has been rented to SingTel which markets the satellite as ST 3 and KT Telecom which calls the satellite Koreasat 8. ABS 2 covers Asia, eastern and central Europe, Africa, and Australia from its operational position at 75 degrees East in Geostationary Orbit from where the satellite will operate for at least 15 years.